Recently, I had cause to thoroughly research diamonds for an upcoming custom order. A gentleman approached me on his wife’s behalf, and requested assistance with a Christmas present. So I’ve had the most lovely time exploring diamonds, diamond houses, the ethics of diamonds… it’s been a wonderful experience. I was a little surprised, however, by the fact that all of his questions were of the most basic information. I realized that while I have learned quite a bit about gem grading mostly by accident and exposure, most people have not, and I set about trying to answer all of his questions plus a few more besides. The first thing that everyone should know about the April birthstone-diamonds, and grading is that every single nuance is measured and quantified on a more or less subjective scale. Gemologists in the trade are screaming at me again, but I think it’s true. If I were to take a lovely brilliant white round diamond measuring a full half an inch across that looked perfect to the unaided eye, and sparkled beautifully, then held it out to any person n the world and said, “Here, I’d like you to have this…” I’m willing to be that every one of those people would light up with delight. Would they immediately pull out a measuring stick, a gem scale, and an ultraviolet light? Of course not. All diamonds are beautiful in their own way. However, it’s been long understood that diamonds are measured in C’s. This is worth going over again, because most explanations are needlessly complicated. The first C is for Cut. Why is this important? All the little facets and planes on a gemstone are designed to bounce light around inside the stone like a roomful of mirrors. If the mirrors don’t line up right, the light escapes and it’s not as sparkly. So if the gem cutter did his job right, all the little angles are well cut, and they line up the right way for maximum brilliant sparkle. But what about those white diamonds? They’re graded on color as well, actually. When a diamond is marketed as a “white” diamond, they are graded on a color scale that starts with D. D is considered the best, whitest blue-white you have ever seen in a diamond. The ones that they use in all those highly commercial Christmas ads for mass produced jewelry are probably D diamonds. Then it goes on down the scale. E is the next whitest and still has some blue-white to it’s shade, and F isn’t quite as blue as E. Then the next color segment is just plain White. The letters there are G-J and all are very nicely white. You may have also heard of Chocolate and Champagne diamonds when looking at colored diamonds. This is slightly deceptive, however, as they are actually colored by their inclusions- they literally are clouded by carbon or dust, and it’s trapped in the crystal structure of the diamond! A number of big name retail jewelers have successfully convinced people that they are a valuable colored diamond akin to blue or green diamonds, when they’re simply included! Personally, I adore these diamonds and use them everywhere. Not only do they go well with all skin types, they are also very affordable! The third C is Carat. No carrots were harmed in the cutting of these diamonds. Carat as in a weight of measure for gemstones. There’s lots of algorithms that take the specific gravity of the stone by it’s measured volume, etc, etc, but really, this is kind of less important, I think, than the actual measurement of the diamond. You could, for example, have a 4mm wide by 4mm long by 1.5mm tall princess diamond. With average other measurements (which are really very nit-picky and complicated), you would have an estimated 0.194 carat stone. It would be very, very shallow. It probably wouldn’t sparkle very well, because it wouldn’t have very many surfaces to bounce light off of, and it would look more like a diamond tile than a diamond gemstone. But, if the same stone had a depth of 3.5mm, it would then be 0.45 carats, and quite likely able to be very sparkly. The last C is for Clarity. Clarity of thought has no place here, but rather this is where it can get very subjective. The grades are Flawless F, Internally Flawless- IF, Very Very Slightly Included- VVS, VS (Very Slightly Included), Slightly Included, Included, Clarity Enhanced, and Industrial. These grades get graded themselves, so you can have a VVS 1 and a VVS2, of which the VVS 1 is marginally better than the VVS2, and the same with VS1, VS2, SI1, SI2, I1, I2, and I3. Somethings are obvious. If there is a large black streak of carbon in the center of the diamond, it has inclusions. Obvious ones to the regular unaided eye, in fact, so it’s likely to be an I3 which means Included with a capital I and most likely not very stable as a gemstone. A stone could also be an I3 with flecks of black and internal fractures as well. If you have to squint and look hard, turning the stone around and over, but you can see them with out magnification, it’s probably an I1. But if you can’t see it until it’s under 10x magnification, then it’s Slightly Included of some varying degree or other. If you have to really look hard with 10X magnification to see it, longer than 10 seconds, then it’s Very Slightly Included. For Very Very Slightly Included, the only people that will see the flaws under magnification are experts. Internally Flawless is just that, perfect on the inside, but could still use some polish on the outside. Flawless, I hope, is self explanatory. Crystals, which are tiny crystals or minerals embedded in the diamond structure. They could even be extra tiny diamonds! Pinpoints, which are small white dots in the diamond. They are tiny opaque white crystals. Carbons are just that, bits of carbon that are trapped. Feathers are small internal minuscule cracks. Little tiny ones are okay because they don’t affect the strength of the stone, but larger ones can be a severe problem, as they can get larger as the diamond “ages”. Clouds are hazy areas inside a diamond. These are a group of extremely tiny crystals grouped together inside the diamond, but one can’t discern the individual crystals until they use magnification. Knots are when an internal crystal breaks the surface of the finished gemstone. Like a pebble in a chunk of mortar, it’s totally separate, and obvious at that. This is something that could be a problem to the stability of the stone, so it’s usually very frowned upon. Cavities are large holes in the diamond where a surface crystal may have been removed, also very bad for the stability of the stone. Bruted is the term that refers to a way of polishing the very edge of the diamond, called the “gridle”. At the very edge of a gemstone, there is a flat spot. It can be thin, thick, and everywhere in between, but it should be finished in someway. If the edge isn’t well done, or there is a feather or a gouge in this area, it is called Bearding. Cleavage refers to a straight crack in a diamond along one of it’s four crystallographic planes. It shows no signs of feathering, but it is a serious internal flaw and can cause the diamond to completely fracture into pieces. Internal graining is only seen under magnification and is simply the way the diamond’s atomic structure flowed when it formed. It can be present to a greater or lesser degree, and is unique to each diamond. Needles are long thin diamond crystals inside the gemstone. Laser Lines are not natural flaws. 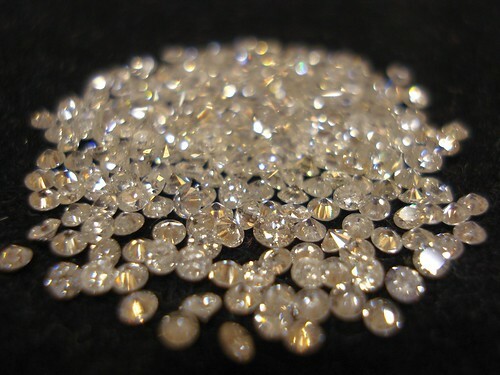 Rather, they are a result of Clarity Enhancing the diamond. Sometimes a diamond’s flaws are somewhat fixable, and a company will use a laser to drill into the stone to access inclusions, or other defects, and then vaporize them. But wait! Doesn’t that leave a whole in the diamond? Well, yes, it does. Since the hole is the size of a human hair or smaller, it’s not usually such a bad thing since you’re usually removing large bits of carbon or crystals, but it can affect the stability of the stone. One can go in and fill the holes that are in the diamond, but this is frowned upon by the majority of the jewelry community. Known as fracture filling, this process must be legally disclosed before sale because it badly affects the value. As a side note, when determining the value of a Fancy Colored diamond, clarity is not quite as important as the saturation of color. So a deep Fancy Vivid diamond that is also heavily included is still worth quite a bit of money as opposed to a white diamond with a similar inclusion level. So, you’ll notice that the majority of these are things that one would only notice under magnification and with some serious training. I don’t know about you, but I don’t carry a magnifying instrument with me everywhere I go- and I’m a jeweler! I’m more than happy to look at jewelry and gemstones with my own two eyes and thoroughly enjoy the pretty sparkles. 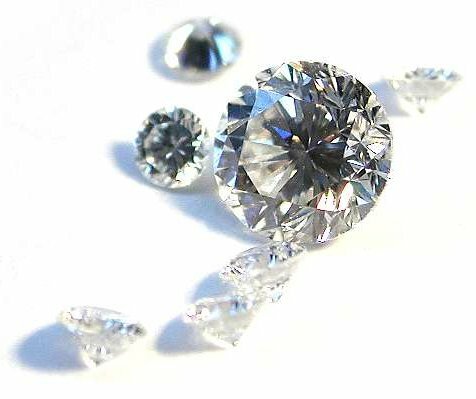 Speaking of sparkles, there are two more grading measurements for diamonds, but they aren’t commonly addressed and quantified. Certain diamonds fluoresce under ultra-violet light. They are very prized among collectors and such, but aren’t so important to usual jewelry wearers, because who really goes around in strong ultra-violet light?. Fire, Brilliance, or Luminescence on the other hand is very important. What’s the point of owning a diamond, one of the stones with the highest refraction rating on earth, if it doesn’t sparkle? I would buy a smaller, more included diamond over a larger cleaner diamond if it sparkled more- and I bet other people would too. So in a rather large nutshell, that’s what diamond grading is all about. Do you need to care about any of this? Well, you should know the basics- just so that you know what you’re paying for in your diamond jewelry. Do you need to shop for diamond jewelry with magnification? That’s really up to you, your comfort level, and your budget. As you go up the diamond grades the prices increase exponentially. If you are lucky enough to have buckets of money to devote to your selection in diamonds, I’m highly jealous and wish I could shop for Flawless diamonds with you. But if you’re trying to decide on the best looking diamond to the regular unaided eye, there are very affordable SI and even a small selection of I1 diamonds available all over the place with excellent stability, amazing sparkle, and wonderful brilliance. So it’s really up to you. What kind of diamond do you really want? I bought a “canary yellow” diamond, miners cut, set in Platinum some years ago. At the time I was told that the important thing was the color and that for colored diamonds, inclusions didn’t matter. i.e, it was all about the color, and that canary yellow was very desirable. All I know was that I liked it and my mate liked it too; so there! FYI; miners cut is an older cut design, not as brilliant (shiny) as more modern cuts (like brilliant cut). Just saw in the newspaper, a huge fancy intense pink diamond, which instantly reminded me about your blog! I forgot to mention that the fancy intense pink diamond was 24ct and auctioned for about $45,000!